In 1972, BLMC bought the company and with hot-shot MD, Geoffrey Robinson at the helm, the 90/120L was conceived. Based on the floorpan and mechanical components of the existing Mini, and therefore of similar dimensions; the Bertone designed hatchback was launched at the Turin motor show in 1974 and it was exactly what the European market wanted. It remains uncertain as to whether BLMC had any serious intent to import or build the 90/120L under licence, but it certainly would have shaken up a few entrenched souls at Longbridge. However, just as the car was getting its first public airing, the tottering BLMC empire collapsed and in the carnage that followed, Innocenti was sold off and the little Bertone-bodied hatchback never made it to the UK. It would remain a pleasant if poignant sight for travellers, right up to the car’s demise in 1993, after a 19-year lifespan. Having established that soft forms and small dimensions often produce cute cars, where does that leave the squared-off Innocenti? Despite being somewhat of the school of sharp folds and delineated creases, Bertone’s styling manages to skirt a deft path by appearing substantial and solid, yet light, compact and planted. The key here is stance, proportion, and tension; all of which are excellently judged. The look is modish and functional; yet friendly and with its four-square stance, assertive. But because of its pert dimensions, generously glazed canopy and neat detailing, it also passes the cute test – with honours. Had this been the Mini’s modish, more upmarket brother, British Leyland would have had a modern, stylish small hatchback to sell, in the teeth of the oil crisis and a good five years before the Metro. Instead we got the Mini Clubman. But shooting yourself in the foot repeatedly was something of a BL speciality, so it remains another great what might have been in that most torrid of automotive suicides. Meanwhile, the 90/120 aptly demonstrates one key point. There really is no substitute for a good Italian tailor. Only its size enables the Innocenti to join the Cute Club, isn’t it? In terms of styling, it’s sharp rather than cute, in both the literal and metaphorical sense. I’d even call it Bertone’s finest small car and a noteworthy contender in a class of car ruled by Italdesign’s efforts at that time. As Eoin pointed out, it’s a significantly more pleasing piece of design than the Metro and has aged considerably more gracefully than the Mini’s other supposed successor. It truly beggars description that BL didn’t bring it to the UK – it would’ve lasted throughout the ’80s with maybe just one facelift until needing replacement by the early ’90s in order to stay competitive. Maybe we’d even have been spared the Mini, I mean: Rover Metro, that particularly nasty entry into the False Aspirational Canon. One reason I keep away from the excellent aronline.co.uk is that the litany of wasted opportunities in the UK industry is so depressing, where resourceful engineers working on a shoestring to produce the likes of the Rover BS got ignored or sidelined by politics or sheer bloody mindedness. The Innocenti is a different point but, again, a hugely wasted opportunity potentially handed to BLMC on a plate. De Tomaso, of course, was not so indifferent and, as soon as Innocenti fell into his hands, he made the best of it. I am intrigued as to what his abandoned Moto Guzzi V Twin engined Innocenti would have been like. 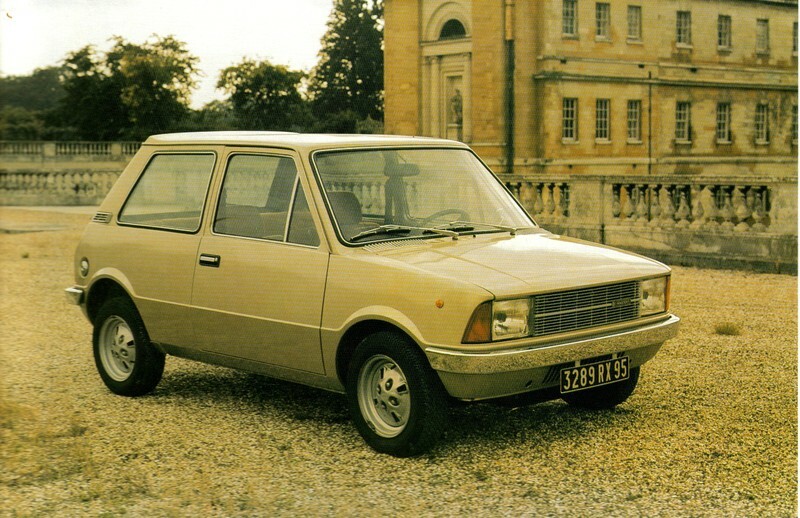 Kris makes a valid point that the Innocenti is probably just too well styled to be conventionally Cute. Is it more Mignon? Or Bijou? Or, bearing in mind its country Piccolo? Maybe just the cliche, “small but perfectly formed”? It sits so much better that the Metro. I’d guess that Issigonis hated it. Okay, I concede the Innocenti fails the fluffy bunny test, but it all depends on how you define cute. If it’s cute as pejorative, then, yes both Kris and Sean are undoubtedly correct. But like the Frogeye Sprite I championed earlier, the Innocenti – (and even the name is cute) – is a cute car almost by accident. Certainly, there’s nothing knowing or manipulative about its charm. I’m guessing – because there is little or no mention of it in Gillian Bardsley’s excellent biography to back up the assertion, that Issigonis would have fought tooth and nail to prevent the Innocenti from being brought to the UK. He was still desperately trying to interest Stokes and Barber in his 9X project. Anything that would have encroached upon that aspiration would have been anathema to him. He’d have hated it anyway, because he had nothing to do with it, so of course, Innocenti’s engineers would have done it all wrong.